Secondly, VT News is often scheduled weeks ahead of time, so if you want them to run the story – or better yet, have it be the main story – they need to have notice that it is coming. But most importantly, we need to develop a good media strategy for you. This involves pitching the appropriate media before the press release runs (we respect and work with all journals regarding embargo dates), finding the best photos to accompany your story, and creating a robust media distribution list, among other things. Some recent examples of stories we did where researchers told us about their upcoming publications far in advance have resulted in some stellar media coverage. Andrew Neilson’s story ended up in the New York Times Magazine. Tom Kuhar’s work ended up on All Things Considered. 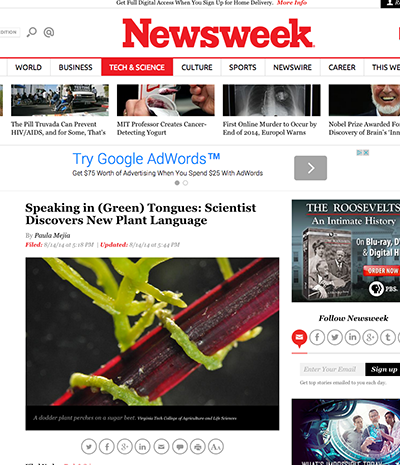 Jim Westwood’s research was featured in Newsweek, and is going to be on the NSF website later this month. While we know that final details of your story are often being hashed out until the last minute, we aren’t terribly concerned whether or not you carried the 1 on the chart of on the 34th page of your paper. We need the big picture story and to identify why this research matters to the larger world. If you aren’t sure whether or not your publication is news release-worthy, just drop us an email or call (1-5417) and we can brainstorm the best way to publicize your results. After that, you’ll enter a job ticket via the job system. After that, next stop, New York Times! This entry was posted in Communications, Marketing and tagged news release, public relations. Bookmark the permalink.